There are many different breeds of pig. 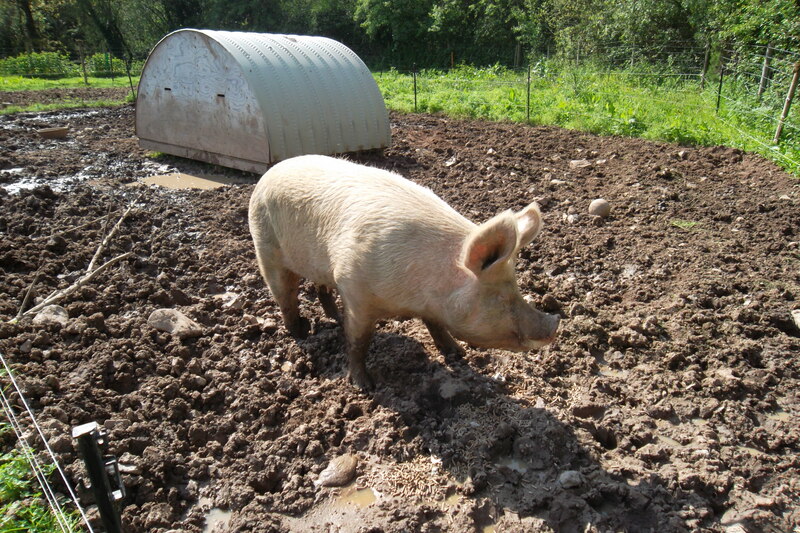 As well as Crackle, we currently have 4 Gloucester Old Spot Cross. Pigs are incredibly intelligent animals and very inquisitive. We have found our pigs to be extremely social animals. They will form close bonds with other pigs and their human carers. They love close contact and will sleep close to each other, as we have noted with both our piglets and weaners. They also like to play both with each other and will play with toys, such as balls. Contrary to what you might think, pigs are very clean animals and will toilet as far away as they can from their sleeping and eating areas. Within hours of their birth newborn piglets will leave their nest to go to the toilet. Experience has shown us that pigs are generally peaceful animals. The only time you may see aggression is from a Sow protecting her piglets if she thinks they are in danger. Crackle often shows her soft side to both her piglets and to those looking after her. Pigs have a great sense of smell, probably because they don’t appear to see very well. A pig’s snout is important and very strong. It needs to be because it requires strength to root around in the ground and sniff things out. At the end of a pig’s snout is a large disk of cartilage which gives it extra strength and flexibility. “Dogs look up to man. Cats look down to man. Breaking News – The Lambing Season at Abbrook is here! Crackle has this morning given birth to 8 piglets. Our dedicated farm technicians have been keeping an eye on her at various hours during the day and night for the last few days. Both Andrea & Pete were there again watching over her during the night last night and finally getting to bed at 4am!! Photographs will appear over the weekend. And, just four days later, eight noticeably more plump, contented piglets enjoy the heat lamp and yet another nap…. The piglets have arrived!!! Comments Off on The piglets have arrived!!! Watch this space! Comments Off on Watch this space! Elsewhere on the farm. Comments Off on Elsewhere on the farm. Is it a Lamb? Comments Off on Is it a Lamb? Mary …… had two little lambs ….. Comments Off on Mary …… had two little lambs …..
More Lambs!! Comments Off on More Lambs!! March, a busy month for the school farm this year. Comments Off on March, a busy month for the school farm this year.